Will Republicans Shut Down the Government Again? President Obama will act unilaterally on immigration Thursday night, a move that will spin Republicans into a frenzy as they access their options to stop the administration from halting the deportations of millions of undocumented immigrants. Many Republicans want to include language to block Obama's executive action in an upcoming spending bill. That could lead to a government shutdown, something Republican leaders swear up and down they are not going to do. Yet, party leaders have failed to control the GOP Conference before. The good news for House Speaker John Boehner and Sen. Mitch McConnell is that even if Republicans head down the shutdown war path, it might not be the calamity for the party that Washington once made it out to be. "We went down the government-shutdown route before, and the results didn't hurt the Republicans at all," says Rick Tyler, a onetime spokesman for former House Speaker Newt Gingrich. "Republicans got reelected to the majority." Many rank-and-file Republicans see an upcoming funding bill that must pass by Dec.11 as the party's best shot to stop Obama from implementing his immigration plan. Boehner has signaled that "no option" is off the table, and more than 60 House Republicans have already sent a letter advocating the approach. In the Senate, top Republican Mitch McConnell has attempted to squash any shutdown banter, but some in his right flank still might push for a funding showdown. Members of the Republican Conference say they don't want the confrontation over government funding to come down to a government shutdown, but many don't see how, even if that does happen, they could lose politically. When asked whether there could be political ramifications for Republicans if they tangled with Obama over the budget and it resulted in a government shutdown, conservative Rep. Steve King, R-Iowa, smiled. "Mean like a larger majority in the House or maybe a Republican majority in the Senate?" he said. "The voters reward us for keeping our oath of office." The Republican Party has weathered government shutdowns before and come out on the other side without paying an electoral price. Between 1995 and 1996, Gingrich led his conference through 27 days of government shutdown. 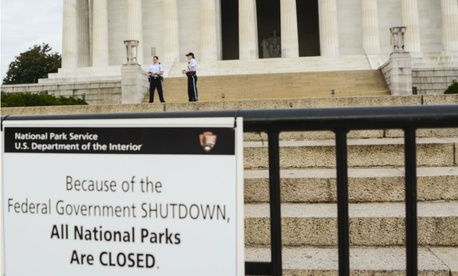 More than 800,000 federal employees were furloughed, national parks were closed, and veteran services were cut. The result? At first, blistering polls revealed that the Republican Party received the share of the blame, and the GOP's popularity plummeted. Less than a year later, however, during the 1996 election, Republicans gained seats in the Senate, and the party's losses in the House of Representatives were minimal, in the single digits. Senate Majority Leader Bob Dole did, however, lose his White House bid, but Republicans kept control of Congress, and over the next two years worked with President Clinton to pass balanced budgets. The narrative of the 2013 government shutdown over Obama's Affordable Care Act follows a similar trajectory. Initially, support for the Republican Party shrunk to almost the smallest margin in history. At the polls one year later, however, voters elected a stronger House majority and helped the GOP regain control of the Senate. "It wasn't the electoral catastrophe that people predicted," said Rep. Thomas Massie, R-Ky., who still argues that it's not the best course of action. Republicans of all stripes agree it's preferable to avoid a government shutdown altogether, but some say the key to winning the shutdown fight at the ballot box is spinning the right message. "If the president is overstepping his bounds and doing illegal acts like usurping legislative authority on the immigration issue, which would be a violation of law, he should be held accountable. If the only way to achieve that is to use the power of the purse, then that is what you've got to do," says Rep. Dana Rohrabacher, R-Calif. "I think the vast majority of people don't want tens of millions of illegals invading our country with the help of the president of the United States, and they're very happy we are trying to stop that invasion." Still, some outside Capitol Hill argue that a government shutdown would hurt the Republican brand in a bigger way that goes beyond the next election. With a new Republican majority in the Senate, this is a new opportunity for the party to prove it can govern. A government shutdown right off the bat could undermine the new Republican majority's chances to improve the party's image and distract from the GOP's own legislative agenda. "We just had an election on government dysfunction, and my belief is that the Republican Congress only has four or five months to prove it can govern and be adults," says former Rep. Steve LaTourette, one of Boehner's closest allies, who served in Congress during the 1995 and 1996 government shutdowns. "If the first thing out of the box is a government shutdown, that really is a danger." Charlie Black, a Republican strategist, says a government shutdown is, at the very least, a waste of time. "It does not accomplish anything. You cannot get the president to make a concession," Black says. "Why even take a political risk if there is no achievable goal?" Some Republicans, however, don't see how they can stand by and do nothing once Obama makes his announcement. "I personally believe shutdowns do more harm than good on the economy as a whole, but I also believe you have to follow the Constitution. And the Constitution says, Congress passes laws. The president can sign them or the president can veto them," says Rep. Frank Lucas, R-Okla. "I don't know that anything is off the table. I just prefer that we be thoughtful in how we respond."